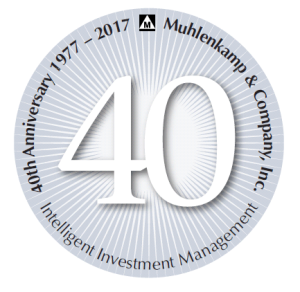 Muhlenkamp & Company's 40th Anniversary - Muhlenkamp and Company, Inc. Muhlenkamp & Company's 40th Anniversary - Muhlenkamp and Company, Inc.
2017 marked the 40th anniversary of the founding of Muhlenkamp and Company, Inc. We are pleased, proud, and grateful that we have been able to serve our clients and the community for over forty years. Special thanks to our clients and our staff, past and present. Click HERE to read our anniversary essay. 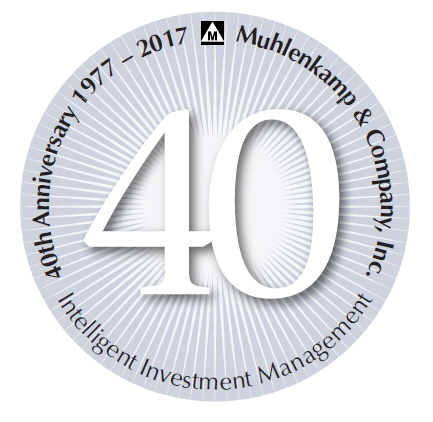 Click HERE to read Reflecting over 40 Years—Lessons Learned and Changes Observed.